Have you heard of Stitch Fix? Stitch Fix is an online clothing and accessories store designed to provide affordable, personal styling services for women. It was created for women who want to wear nicer clothes but who don’t want to spend hours combing through clothing stores to put together outfits. I heard about Stitch Fix about a year or so ago from a fellow blogger. I didn’t sign up then because, honestly, I felt it seemed a bit indulgent. Fast forward to a month ago … I was desperately trying to find fresh, stylish outfits to wear to the Haven blogger conference when I realized my closet literally looked like a time capsule from 1997. The time I’ve had to shop for clothes has been nearly non-existent for the better part of the last decade. On the rare occasion when I do visit the mall looking for clothes for myself, it’s usually with one or more kids in tow. That typically leads to an excruciating dressing room experience, and I often still don’t find anything I like. I’m also not one to spend a lot of time reading fashion magazines or perusing Pinterest for fashion trends, which means I’m not exactly on the up and up when it comes to current fashion. In addition to solving my no-time-to-shop and fashion-rut problems, I finally took the plunge and signed up for Stitch Fix last month because it’s inspiring me to eat well, work out and look my best. Plus it also fits my current budget and money goals. I chose the cheapest option in the Stitch Fix profile, which brings the price points of most pieces in line with stores like Gap, Express or Banana Republic. I know if I go to the mall to shop for clothes, I’ve got about a $20 gas bill. Of course, I have to get a soft pretzel and strawberry lemonade at Auntie Anne’s. After that, we’ve got a few impulse buys thrown in and probably a lunch or dinner bill. And I may or may not actually find any clothing I like! So, for me, Stitch Fix is actually a cheaper solution overall. So let’s take a look at my first Stitch Fix, shall we? I totally did not anticipate how excited I would get about this little box coming in the mail. I am officially hooked on Stitch Fix! I changed the frequency of fixes to come every month now, instead of every other month. The first piece I tried on was the Nic Striped Dress. I love the material, the fit, the length and the pattern. I felt like this dress was made for me. It was a keeper! I also love how Stitch Fix provides a style card with suggestions for what to wear with each piece. 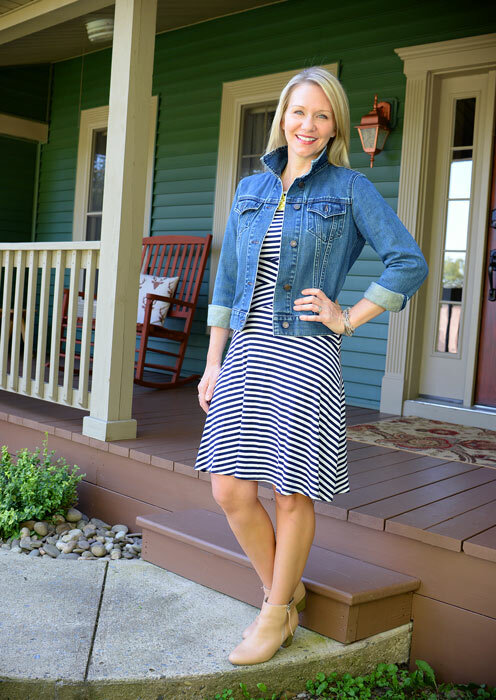 I used their recommendations and paired the dress with a denim jacket and ankle boots from my closet. The material is super soft and feels high-end. This is literally my new favorite piece of clothing. I wore it to church last Sunday confidently! The second piece I tried on was the Turk Bow Back Top. I loved the fabric, color, polka dot pattern and cute bow in the back. However, I ultimately returned this piece because I felt the fit was a little too flowy for my taste and the length stopped at the widest spot on my hips. 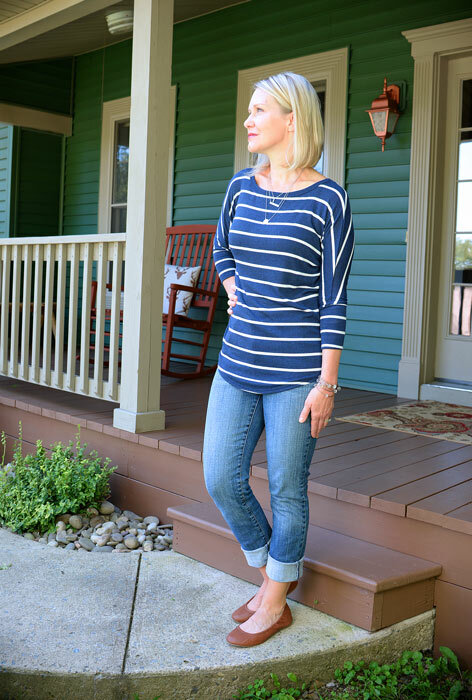 The third piece I tried on was the Corinna Striped Dolman Top. Love everything about this one. Keeper! 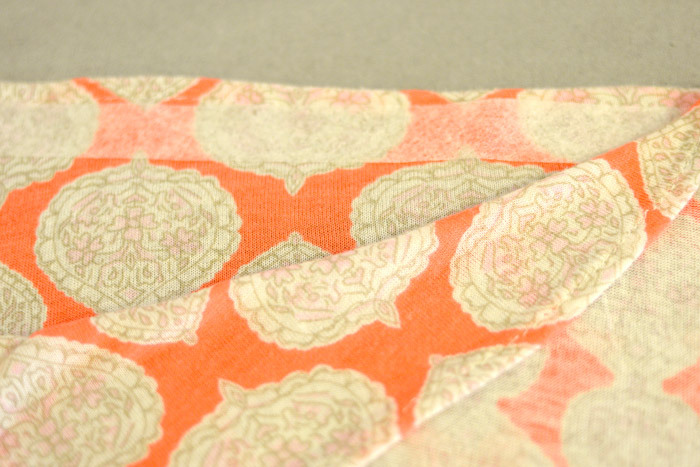 The length, the color, the pattern, the color … perfection! I paired it with some Levi skinny jeans and $10 ballet flats from Walmart I had in my closet. The fourth piece I tried on was the Yuli Lace Cap Sleeve Blouse. 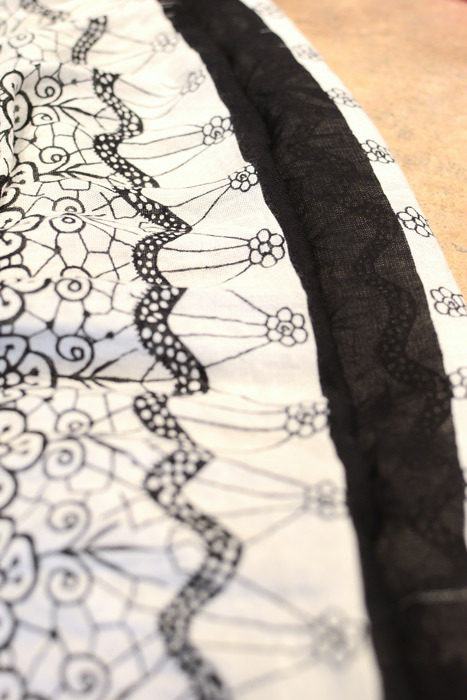 I loved the lace detail of this top and the fabric felt heavy and luxurious. However, I’m not a fan of capped sleeves (upper arm flab) and, again, the length stopped at the widest spot on my hips. Returned this one. 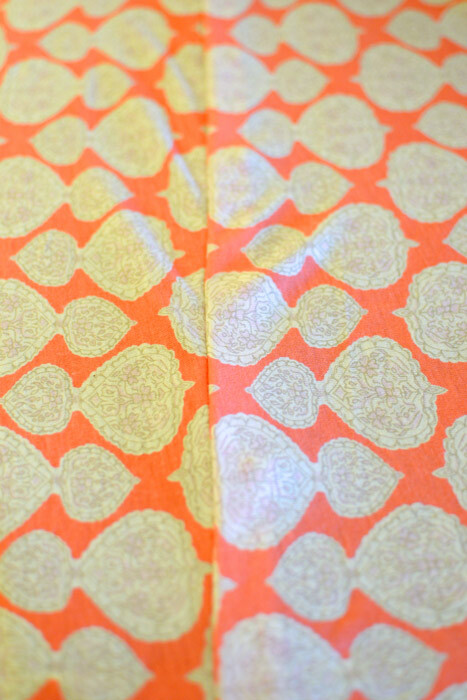 This top did inspire me to create a pair of shorts to go with it, though. I simply took an old pair of white jeans (probably from 1997), cut them to the knee, and added a seamed cuff using iron-on hemming tape. 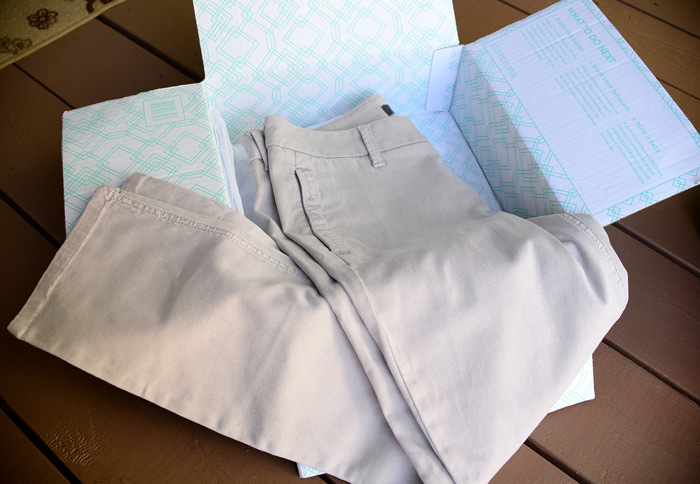 The final piece in my Stitch Fix box was the Patrick Cropped Chino Pant. I didn’t pose for a picture in these pants because, frankly, they looked absolutely disastrous on me. You know that moment in the dressing room when you see how bad something looks on you and you race to get it off before the mirror reflection is burned into your memory? Yea, that was these pants. They fit my body, but they definitely did not flatter it. Returned. So ultimately I kept two out of the five pieces in my first Stitch Fix. I’m excited about what will be in next month’s box! 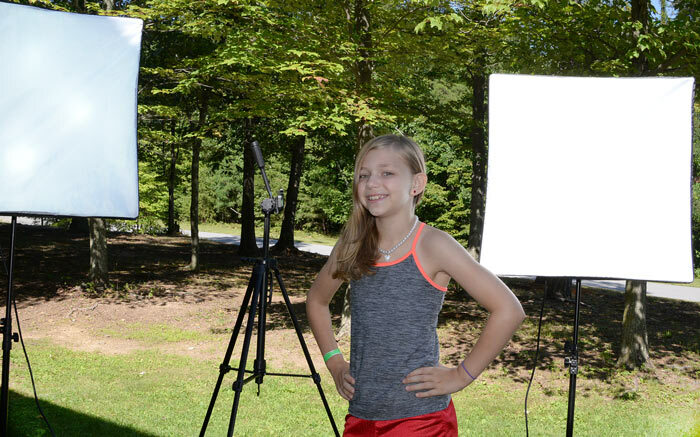 Finally, I have to share with you the photographer who took the pictures for this month’s Stitch Fix “fashion shoot.” My normal photographer (the hubs) was out of town last week, so I enlisted the help of a backup – my 8-year-old! Sign up for a Stitch Fix account. 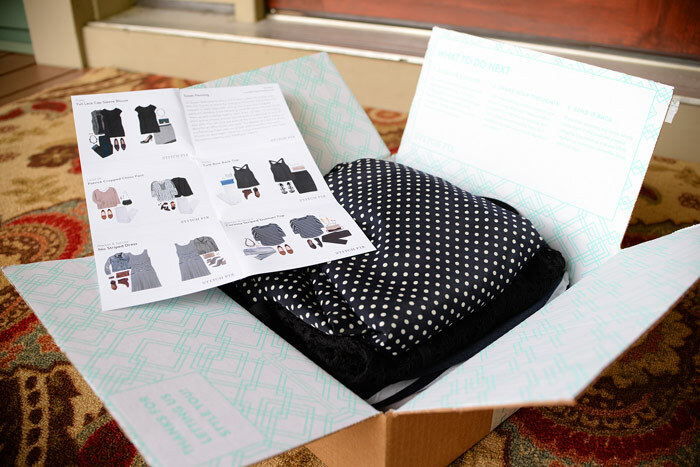 Choose when and how often you’d like to receive a Stitch Fix. Then go to checkout and pay a $20 styling fee (this is then applied as a credit toward anything you choose to keep from what they send). One of the Stitch Fix stylists will look in-depth at your style profile, sizes and preferences and put together a box of five items based upon what they think you’ll like and what they think will work for you. You’ll receive your Stitch Fix in the mail. You have three business days to go through everything and choose what to keep and what to ship back in the postage-paid shipping bag they include in the box. Stitch Fix does not require a membership fee or a monthly subscription and you can cancel or change how often your fix ships at any time. This is a sponsored post written by me on behalf of Vaseline. All opinions are 100% mine. Every year, right before Thanksgiving, I take a deep breath, give myself a little pep talk about how, “You can do it!” and prepare to hook myself up to a continuous, intravenous supply of caffeine until Jan. 2. This year, however, I’m vowing to hop off the holiday hamster wheel for a few moments to experience the true meaning of the season, and to take care of myself for once. Today I thought I’d share four specific ways I’m doing that right now. You should try them, too! 1. Stop doing something that’s bad for you. 2. Start doing something that’s good for you. Again, these are baby steps … no added stress allowed. 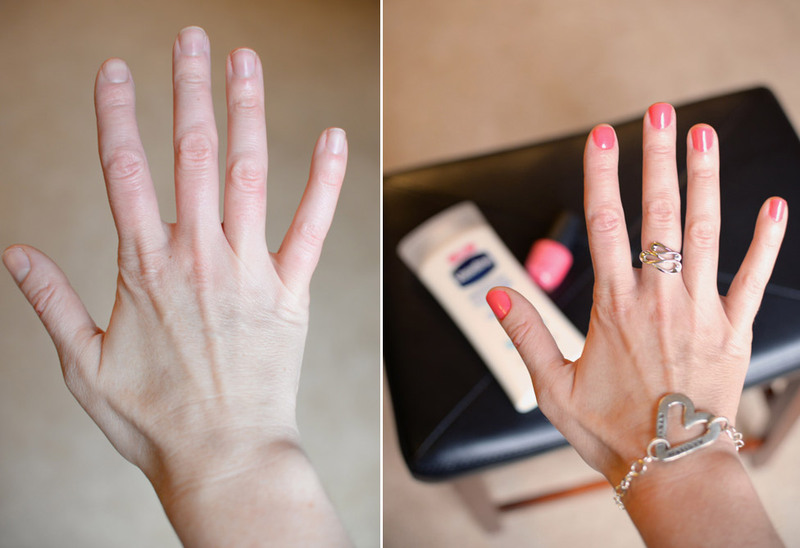 In the colder months, I suffer from severely dry skin that becomes itchy and painful. In an effort to improve my problem and pamper myself a little, I recently took the Vaseline 5-day challenge. 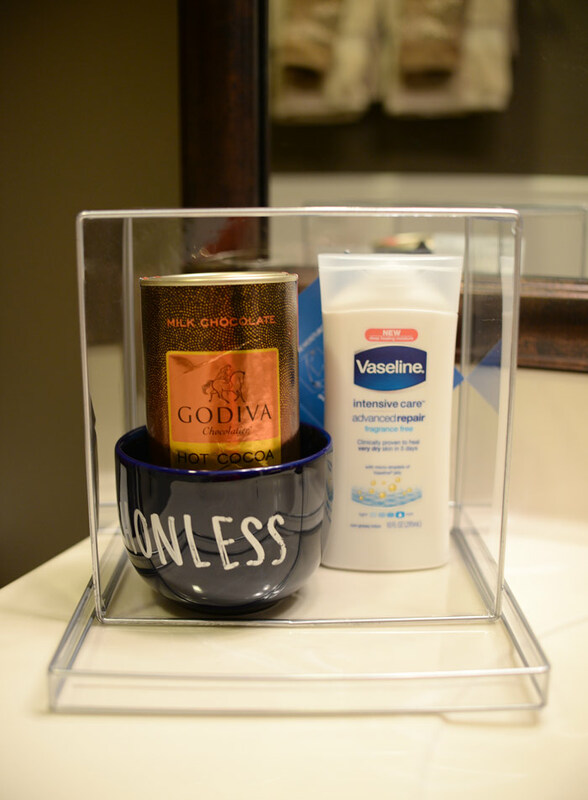 I received a Vaseline healing kit in the mail that included Vaseline Intensive Care Advanced Repair Fragrance Free Lotion, dry skin test strips, a personalized mug, GODIVA hot cocoa and marshmallows. I’ve used the lotion regularly over the past week and have noticed a difference in the way my skin feels. The proof is in the strips. It’s amazing what a little lotion, jewelry and polish can do for my DIY project-ravaged hands. 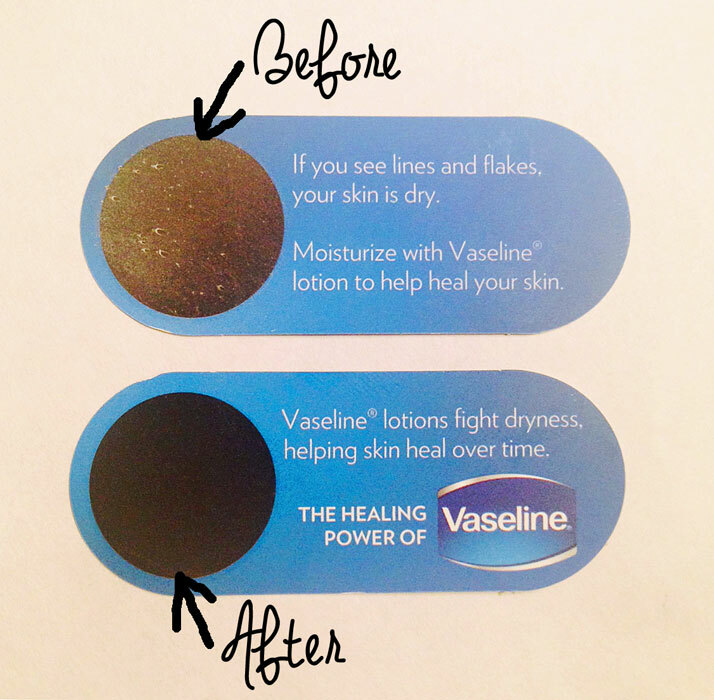 Vaseline Intensive Care Lotions contain healing micro-droplets of Vaseline Jelly to deeply moisturize dry skin. 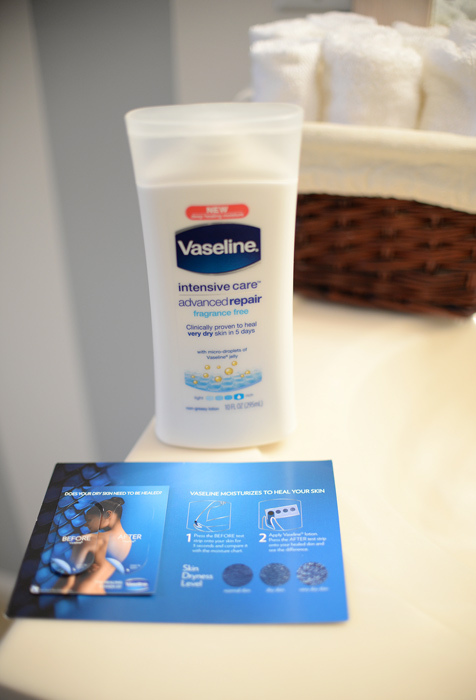 The Vaseline Intensive Care Advanced Repair Fragrance Free Lotion is clinically proven to heal dry skin in five days and keep it healed for three weeks. The 10-oz. bottle I got is about $4.99 at your favorite mass retailer. I’ve always found it a bit ironic that families spend Thanksgiving Day expressing gratitude for their overflowing, abundant blessings, then immediately rush out the following day to stuff their shopping carts full of more stuff. This year, I’m spending more than just one day focusing on gratitude. 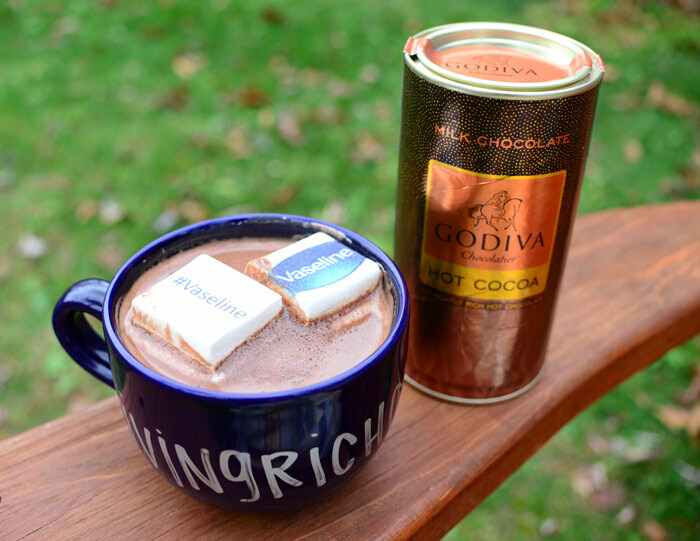 When I can spare 15 minutes, I love heading outside with a warm blanket and a cup of cocoa. 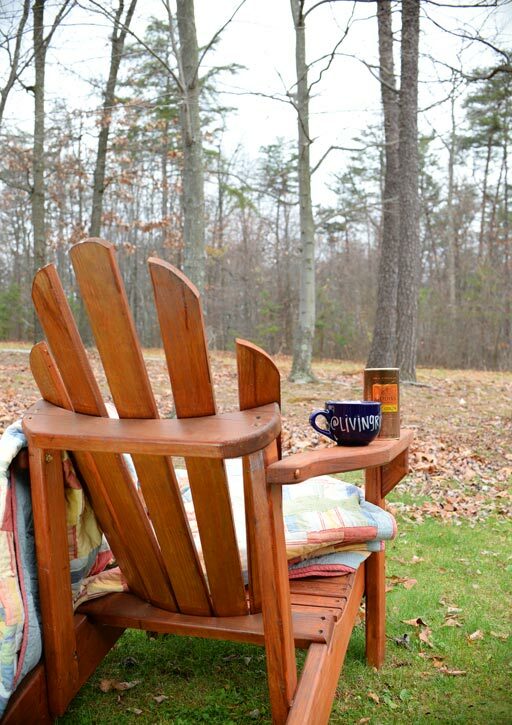 I chill out in my Adirondack chair; enjoy the crisp, fall weather; and express thankfulness for this extraordinary life. It’s one way I’m avoiding getting sucked into the holiday shopping vortex. Aren’t these marshmallows the cutest? 4. Spend one day doing nothing. One Saturday a few weeks back, I did nothing. And I can’t wait to do it again. On my “do-nothing” day, I slept in. I didn’t make the bed or do any laundry or dishes. I lounged around and watched movies and played games with my family. I flipped through home magazines and catalogs. My do-nothing day was glorious and therapeutic. Some of my most creative ideas and favorite memories have come as a result of do-nothing days. The holidays can be hectic and stressful; I certainly don’t have to remind you of that. But I hope you’ll consider trying a few (or all four) of these ideas. 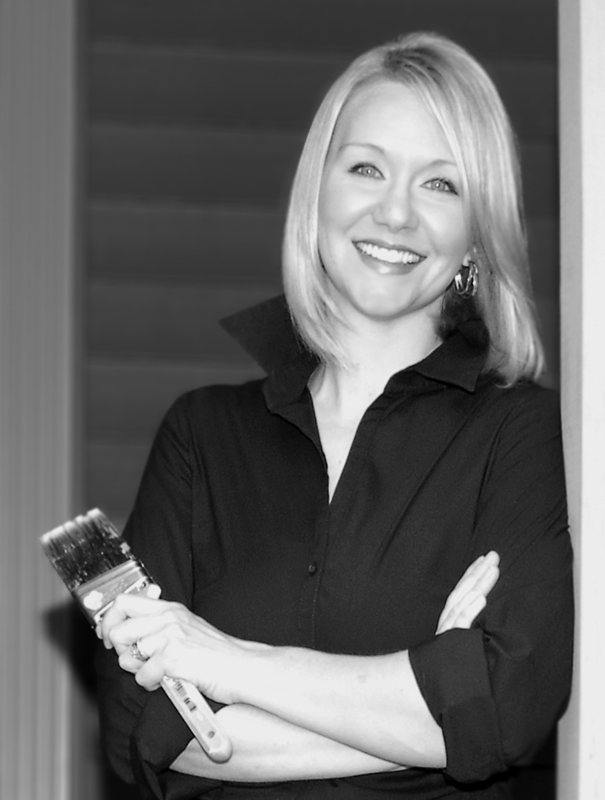 They will help to give you the meaningful, healthful and joyful holiday season we all crave. Like many of you out there, it seems that when the chilly weather shows up, so does my obsession with infinity scarves. Now, I’ve already got a closet full of regular scarves collected over the years. But since they are not infinity scarves, they haven’t seen a lot of wear recently. Fortunately, I’ve discovered a ridiculously easy way to convert a regular scarf to an infinity scarf, so I thought I’d share that thrifty hack with you today. 1. 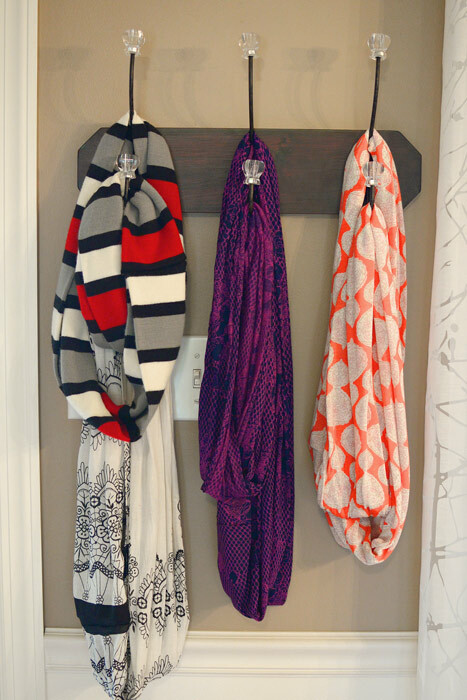 Pick out a regular scarf you want to convert. I chose these four. The one on the left and the one on the right required special treatment, which I’ll share toward the end of the post. 2. 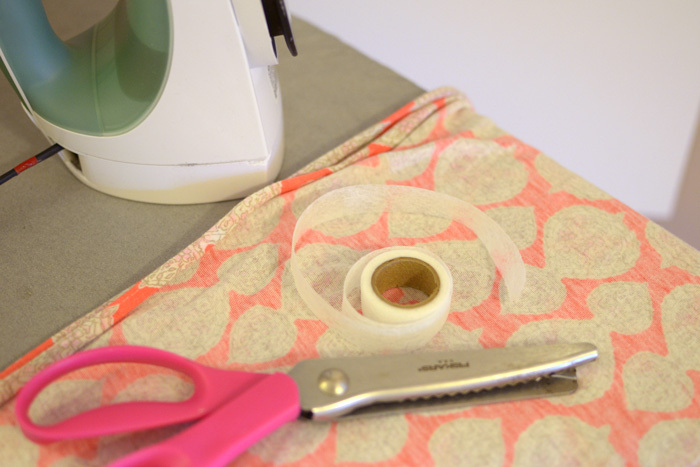 Grab some iron-on hem tape and turn on the iron to the hottest setting safe for your fabric. 3. Line up the two short ends of the scarf, with the ugly side/inside of the scarf and seams facing out. 4. Cut a piece of hem tape and sandwich it between the ends at the top. 5. 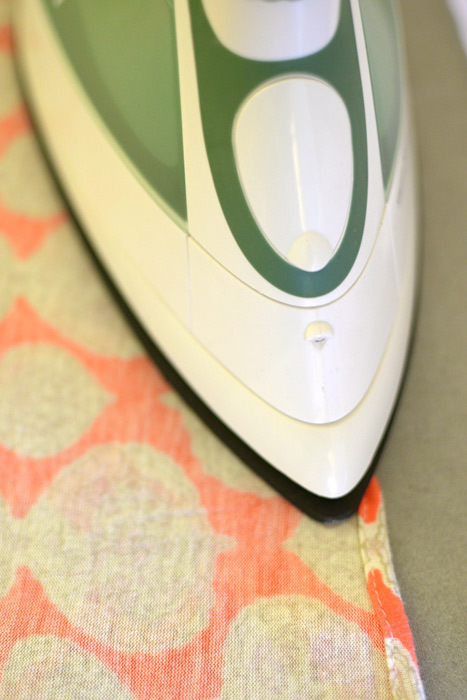 Line up the ends again and iron the layers together. 6. 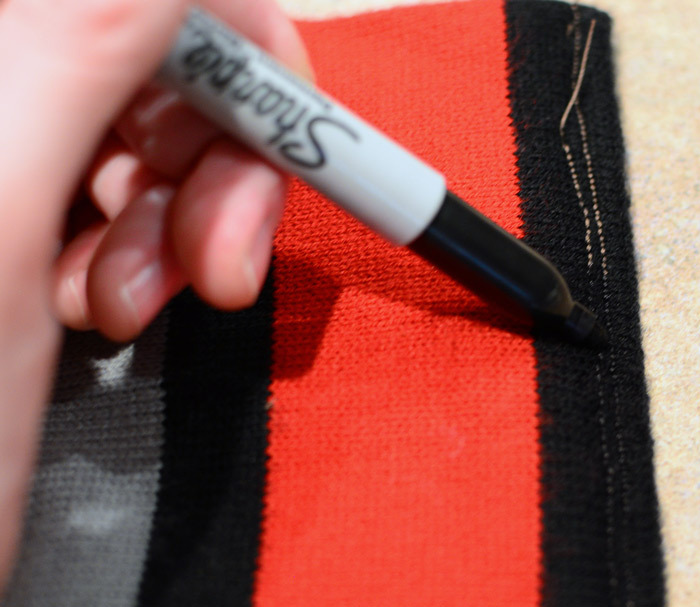 Turn the scarf right-side out and check to make sure the hem tape worked. Done! 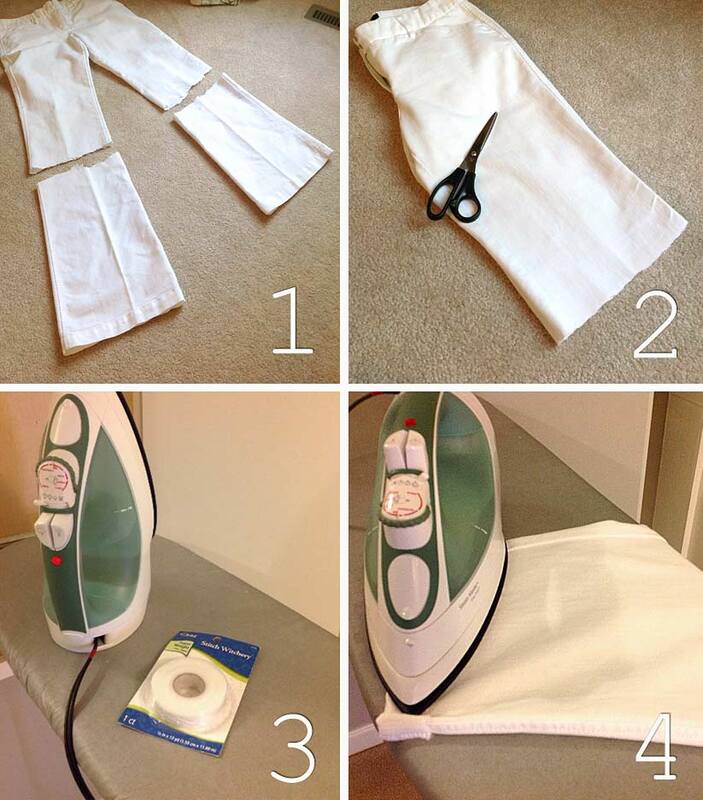 I used this same no-sew method for the purple scarf. 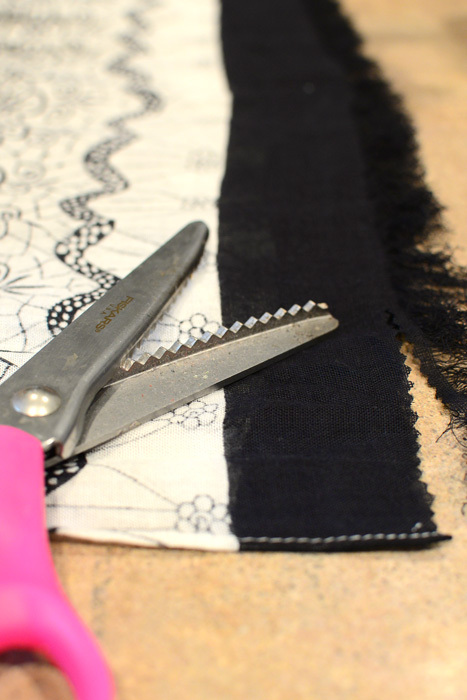 The black and white scarf had fringe on the ends, so the first thing I did was trim that off with pinking shears. 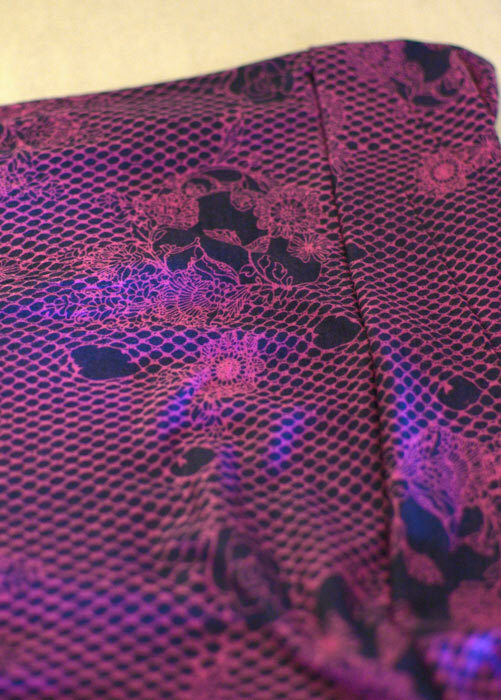 This scarf is so thin I was worried the hem tape would bleed through, so instead I sewed a quick seam connecting the two ends. Again, I made sure the ugly side of the scarf was facing out when I did this. I probably should have used a zigzag stitch for this seam. 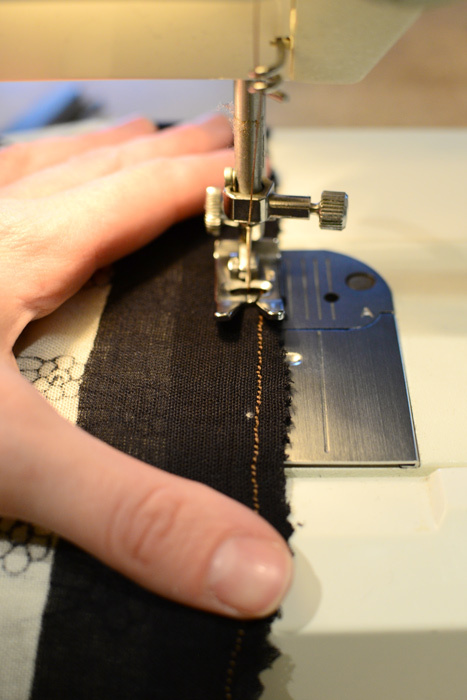 But I seem to always create a balled-up, tangled mess of thread when I set my sewing machine to the zigzag stitch. If anyone has any tips for how to avoid that insanity, I’m all ears. I sewed together the striped scarf as well because I figured the hem tape may not hold together fabric that thick. I estimate that I spent about 40 minutes total making all four of these scarves. 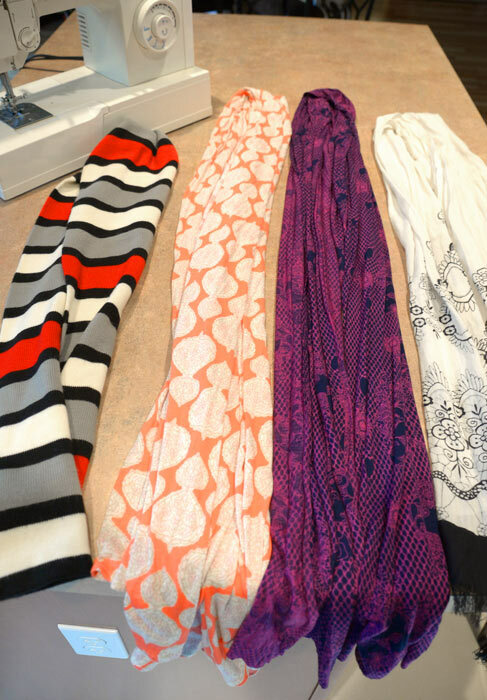 Would you ever try converting your regular scarves to infinity scarves?